One of the most important challenges an enterprise faces is locating and hiring the top candidate for a job. However, ineffective sourcing and recruiting processes, tough competition for talent, and arbitrary evaluation criteria make the exercise difficult. In this environment, the concept of tapping advances in artificial intelligence (AI) to better hire contingent workers – as well as mange and optimise this workforce – is intriguing. By analysing data and performing automated work “behind the scenes,” AI promises to not only enable faster decision-making and deepen understanding of a company’s workforce, but also free up resources so mangers and business leaders can spend more time on creative thinking and strategic planning. 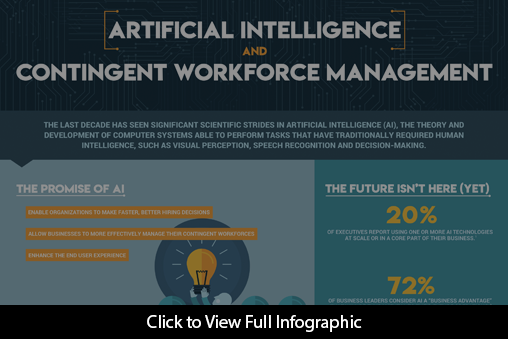 To help organisations better understand AI and its potential business impact, PRO created this infographic, which highlights some of the basics of AI and a few areas are particularly exiting for organisations as they relate to contingent workforce management. For a deeper look at artificial intelligence and its potential to help organisations better hire and mange contingent workers, download PRO Unlimited’s “Artificial Intelligence and Contingent Workforce Management” fact sheet. If you or a member of your team would benefit from a further discussion on how PRO is helping companies implement winning contingent workforce management programs globally, please contact a PRO presentative at +44 (0)203 633 3912 or email at information@prounlimited.co.uk.